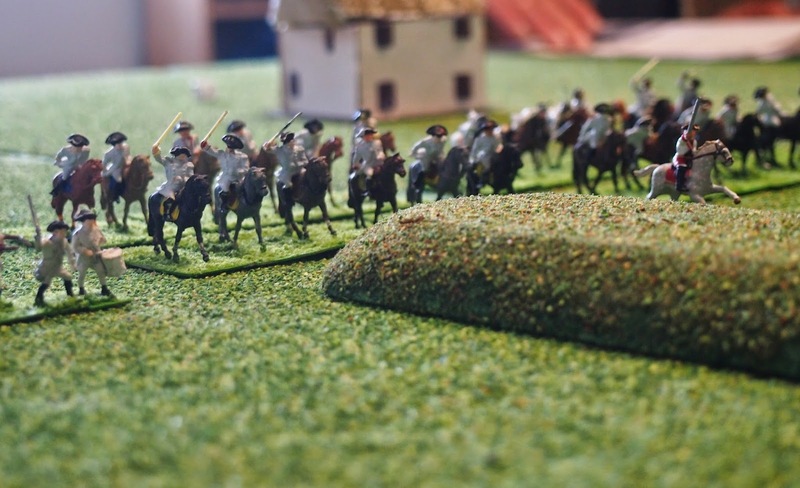 We took Beneath the Lily Banners (Second Edition) for a ‘spin’ as the second of our tests of rules for the Lace Wars, and War of Spanish Succession in particular. 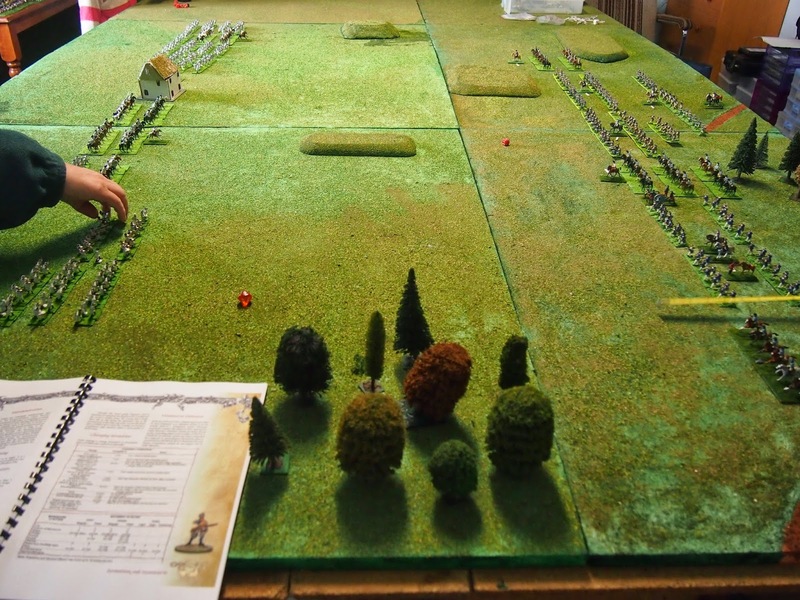 I re-set the table so that we had the same battle as for our test of Age of Reason. 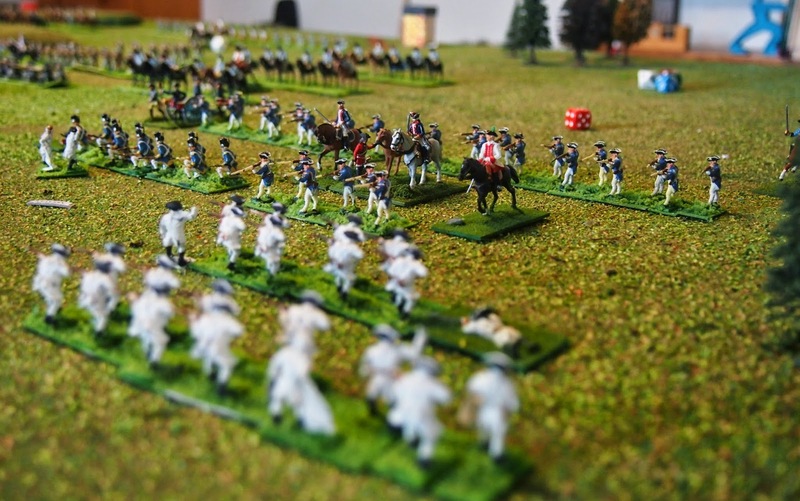 This in itself I regarded as a minor triumph, as I'd actually never done this before and desperately hoped James' photos would suffice for the job - judge for yourself by comparing with the initial shot for the Age of Reason playtest. We had all read through the rules and, while there did not appear to be anything that seemed outrageous or obnoxious to any of us, we did not get the sense that they would out-do Age of Reason (hereafter AOR). We were all not a little concerned at the large volume of ‘eye candy’ most of which, while lovely to look at, disrupts the flow of the text and makes what could be a 20-page rule book extend to over 100 pages! We did not want to prejudge the rules though, so a full play-test it was. 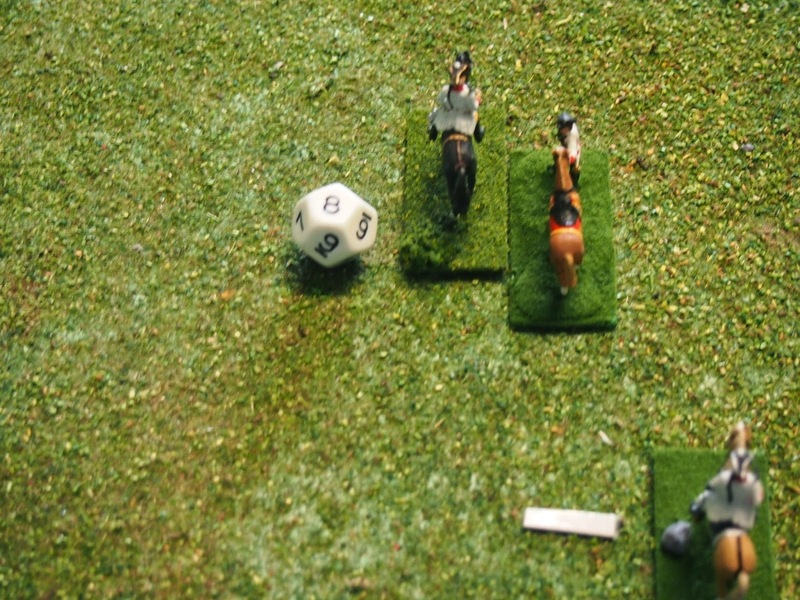 Wishing to play the rules in full, we rolled for our commanders. James threw a ‘1’ for the French C-in-C making him, appropriately, a ‘plodder’. Mark managed a ‘5’ for his Bavarian wing commander, who was therefore skillful and I rolled a ‘2’ for my Austrian, making him competent. The implication of these ratings became immediately apparent. Beneath the Lily Banners (BLB) uses a ‘pip-style’ restriction on units which may move in a turn. This is determined by a die roll each turn against the quality of the leader. 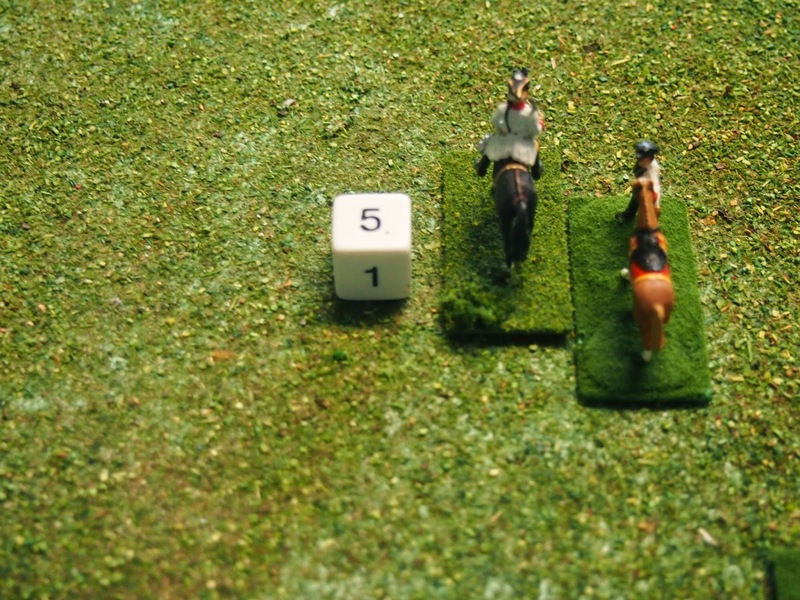 The result of this is that from none to all of the units of a command may be given ‘orders’ in a turn. Far from a means of reflecting command and control, this amounts to a ‘prompting’ technique. If a commander is only able to get orders to 1/4 of his units, for example, these will be the only ones that may move, irrespective of current orders or the situation of the battle, and irrespective of any divisional or brigade structure. This is not a mechanism that we enjoy, or favour for such effects. 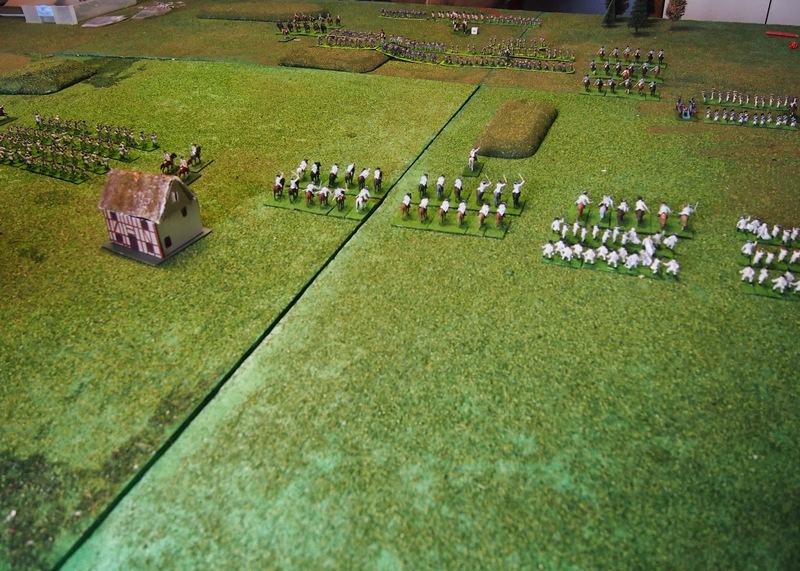 The immediate effect was that the army, and indeed the brigades broke up from the first turn. Off went my Imperial right wing, under my selection of units to move, my initial move gave me the ability to move 3/4 of my units. The French and Bavarians had barely got going as parts of my force advanced. 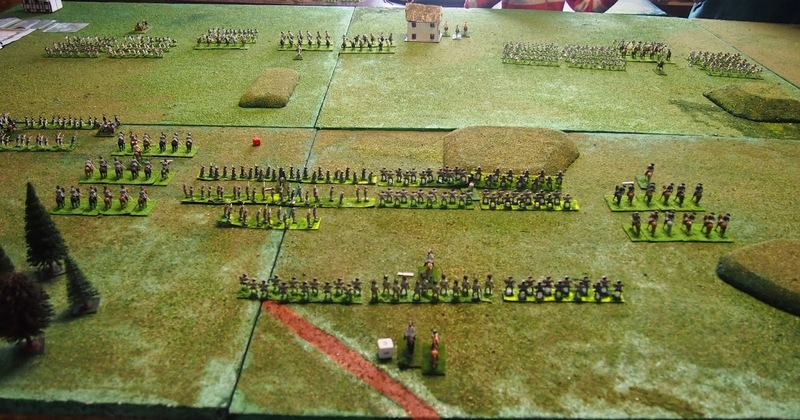 The infantry move being 4" and not all forces moving every turn, it was quite obvious that many turns would be required to bring the action to a conclusion. BLB suggests about a ten minute turn time, to explain precisely this, but on the whole the ANF prefers larger but fewer moves to this kind of solution to the problem of command and control. Here in the Allied centre not much had happened. 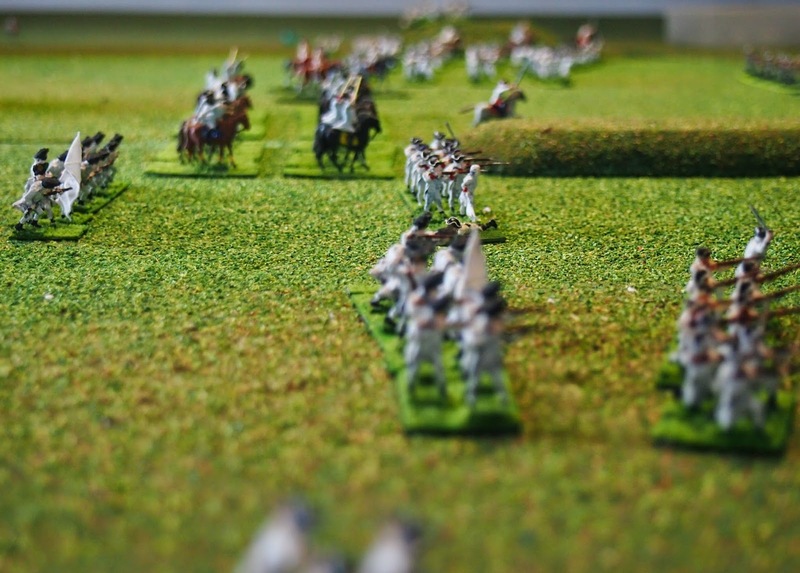 My strategy was the same as before, to hold back the cavalry and see what could eventuate. 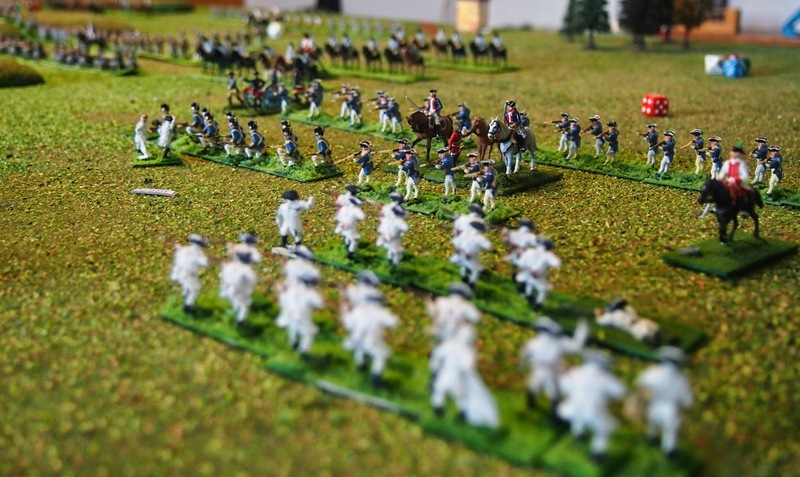 One minor problem associated with the large number of moves is that if sufficient photos were to be taken to provide a proper description of the situation of all forces in that particular move, the battle report would involve literally hundreds of photos. That is definitely not to say that the ANF fights its battles 'for the record' - certainly not I, as I can never remember enough! But it is to say that this account is of necessity rather fragmentary by comparison to my previous post on AOR. 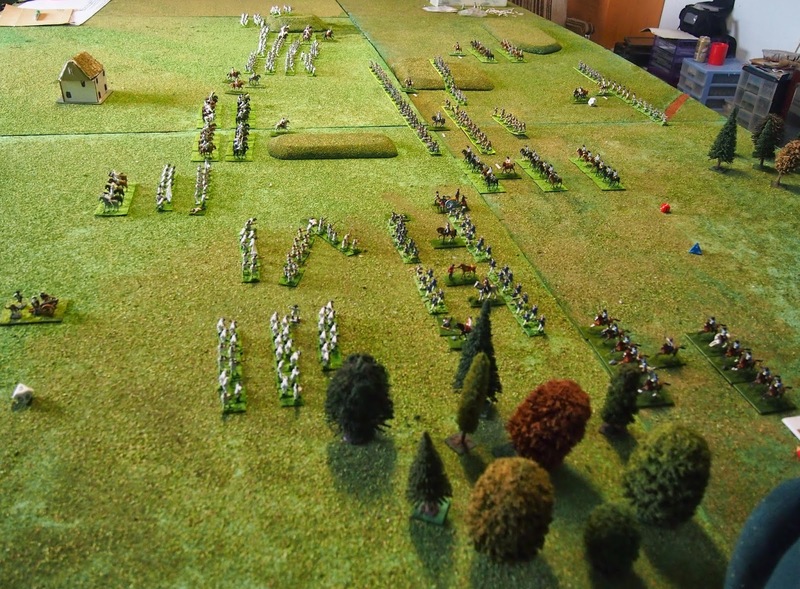 Here the view from the French position on Move 3. Some advance by the Allies is discernible on the French right flank. But we have to remember, we are only half an hour into the battle. 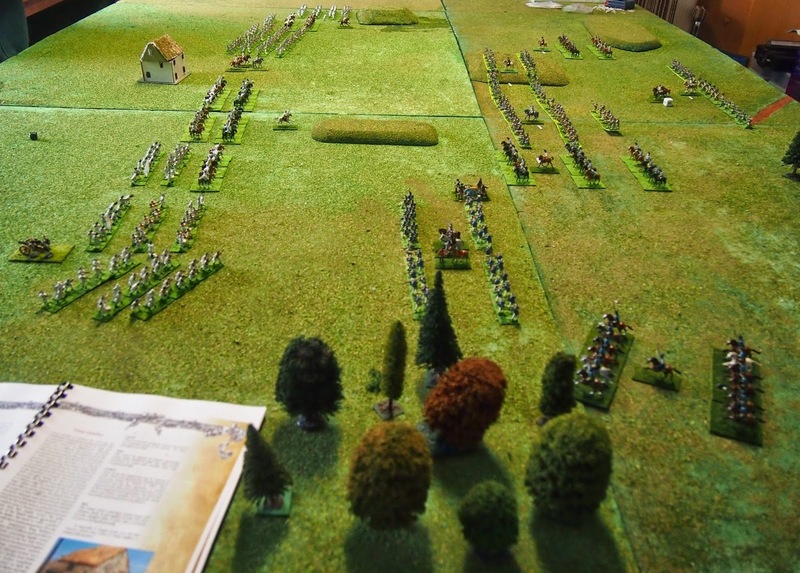 A nice view across the battlefield from the Austrian right/Bavarian side of the table. The moving mechanics had been mastered by this point, nothing too hard there. Keeping the lines together was evidently to be quite a challenge, though. 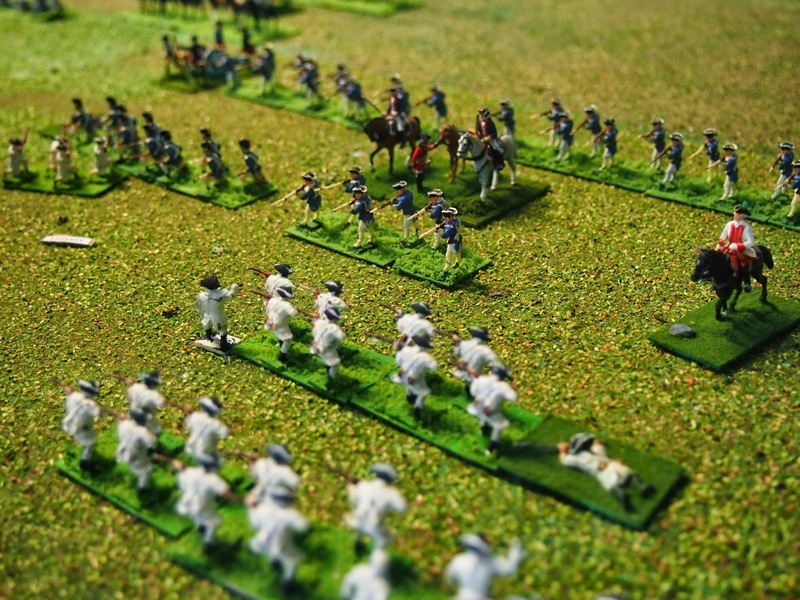 The forces looked as if they were about to engage each other, and were certainly closer now in the centre. It was of course very unlikely that the French would be kind enough to refuse their centre as they had done when we'd used AOR. What would they choose to do? Not a great deal, when they found themselves with the ability to move only 1/4 of their force. Fortunately the Bavarians could usually do a great deal more as they had a much finer commander. 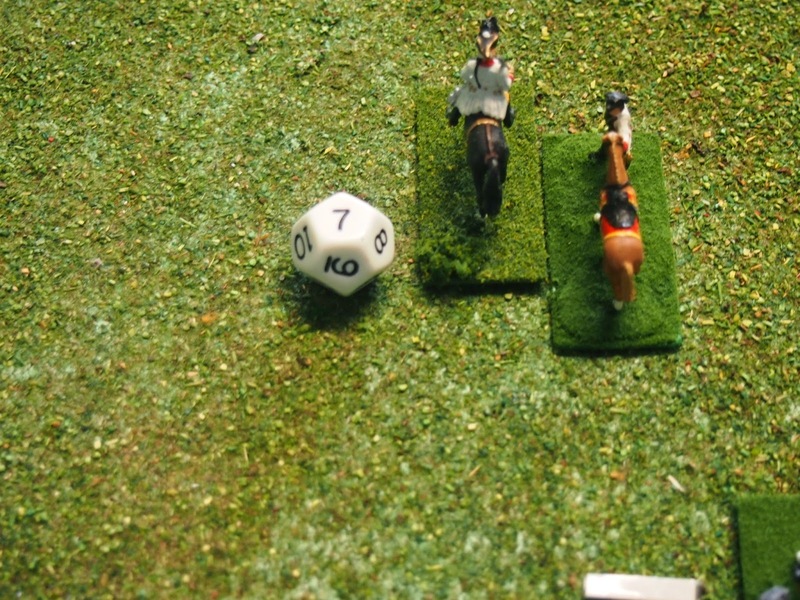 And here he is, amidst the Bavarian lines, standing firm against the odds. On to Move 4, and I at least had already decided in my own mind that this was not a rules set with which I was especially comfortable. 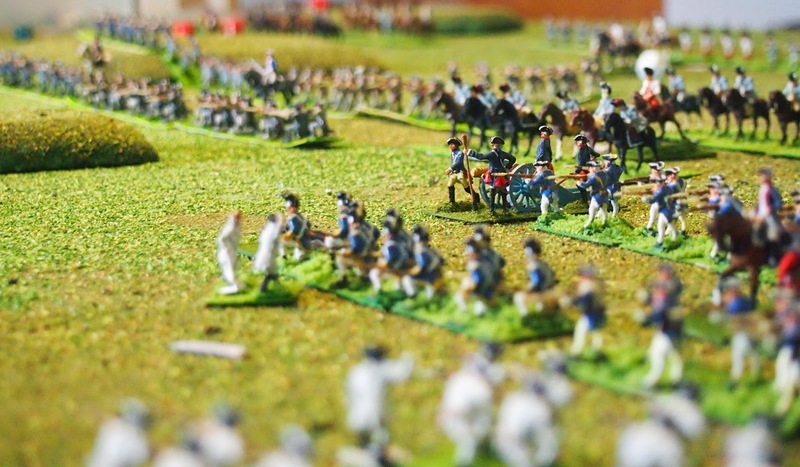 I've never personally liked 'pip'-based systems of command and control, the random nature of the resultant moving has never seemed particularly realistic, although I am of course aware that many others disagree. 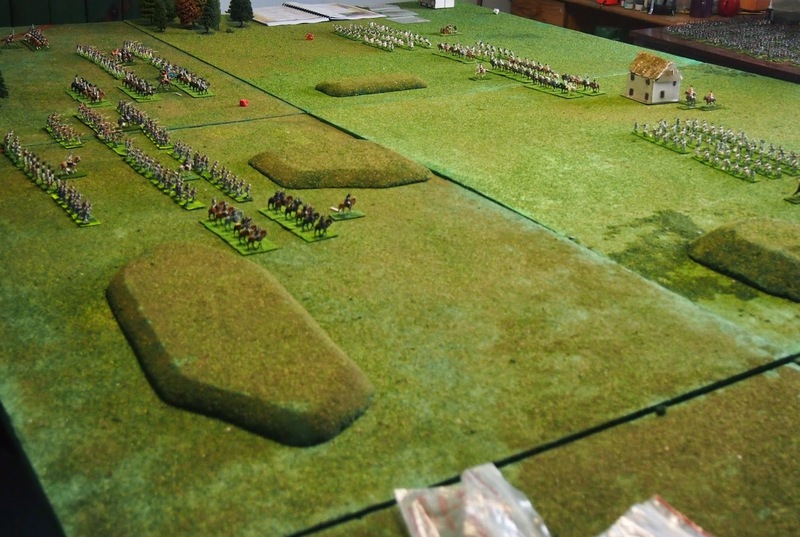 A view across the lines for Move 4, with the rules open for good benefit to show we really were using them. You can clearly see the way in which the Bavarians have advanced well beyond their French compatriots (well, colleagues) and that even the French line looks rather ragged. The same viewed from the French vantage point. The temptation for the French to advance is plain; but the command and control problem would be the only obstacle. 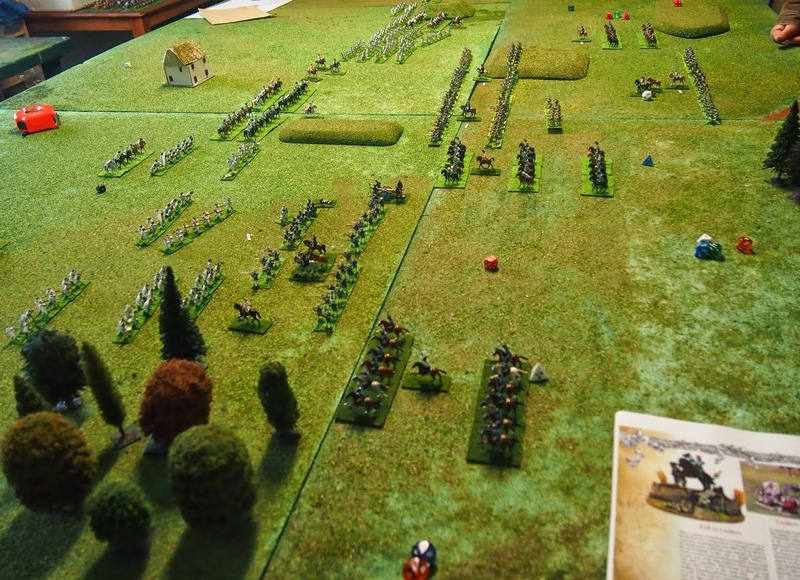 The Austrians had been able to position themselves in a relatively unified way to face the Bavarians. Four moves up, and no firefight yet. The guns were completely out of it. 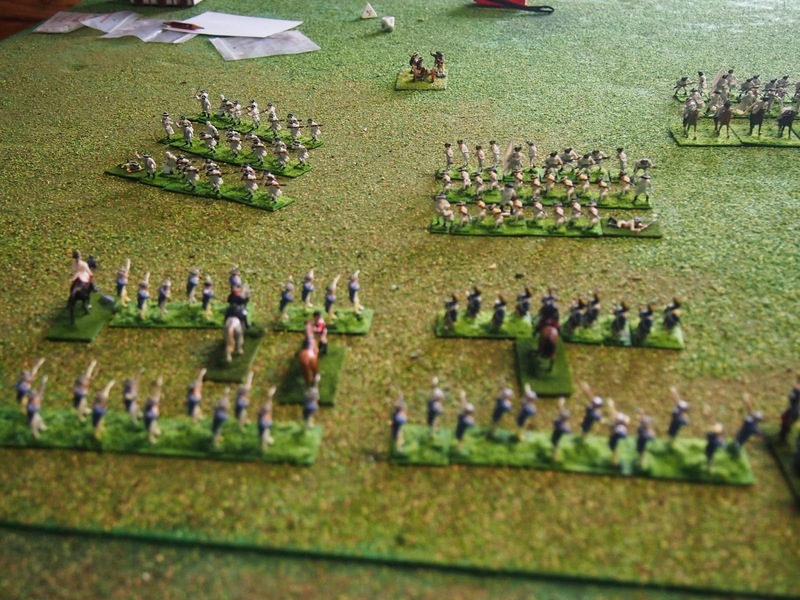 The Bavarians had at least got themselves into a neat line with their cavalry drawn up in support. A fast learner, Mark! By Move 5 we were really hoping for some action. To be fair, very little time either in reality or on the table had actually elapsed. 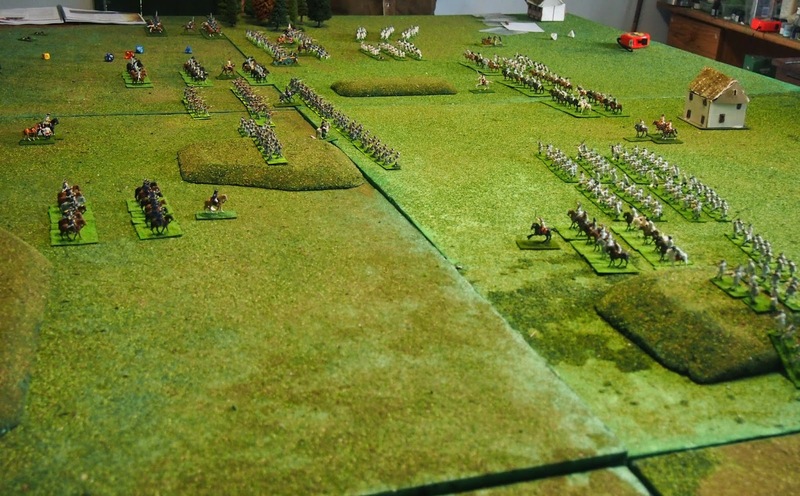 In fact, if anything, if one were to take the 10 minute per turn idea literally, it was becoming evident that the action would be over within a much shorter space of time than historically plausible. Easily remedied, then, by extending the notional time period to say, half an hour - but then, what of the restrictions on movement for the troops? 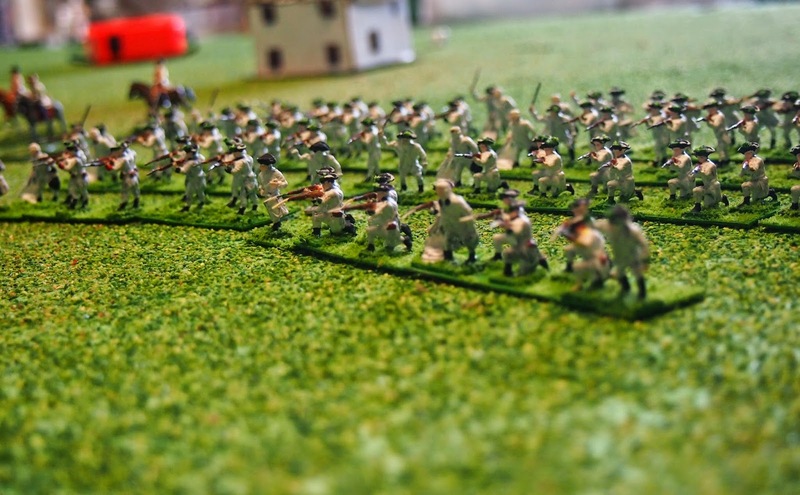 As we mused these weighty questions, the Austrian right flank finally came into shooting range of the Bavarians, and battle truly commenced. Here's how it looked forward from the French command vantage point - nothing much in danger, nothing much in doubt - nothing much of anything, truth to tell. 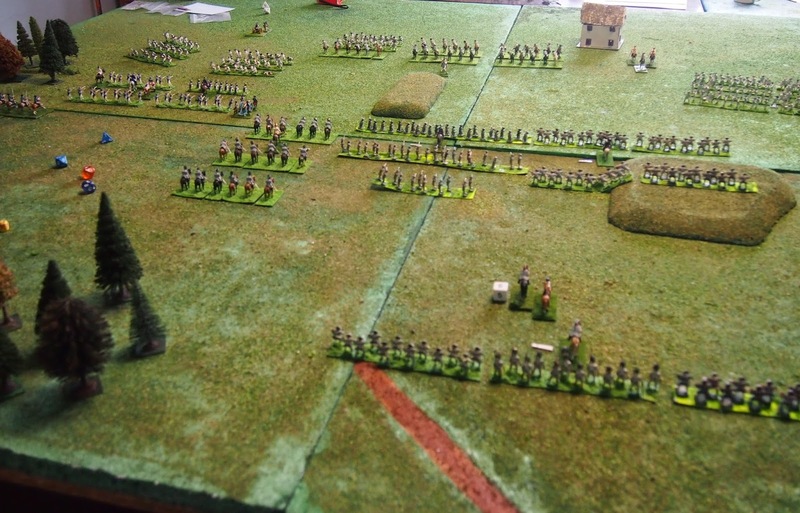 Here is a view from the French right flank showing the Austrians advancing, but there is evidently plenty of time to deal with the threat. 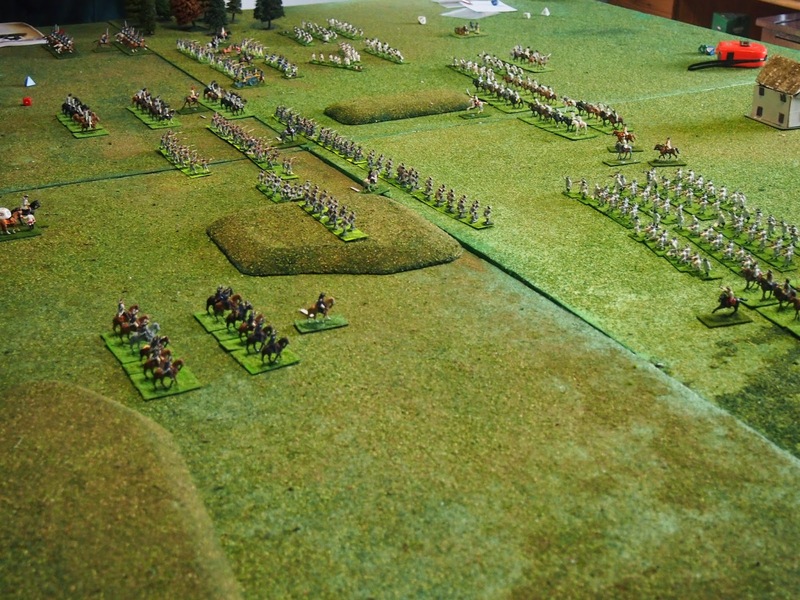 Now a shot of the real action, here come the Austrians against the Bavarian line. That huge gap on the French right again. 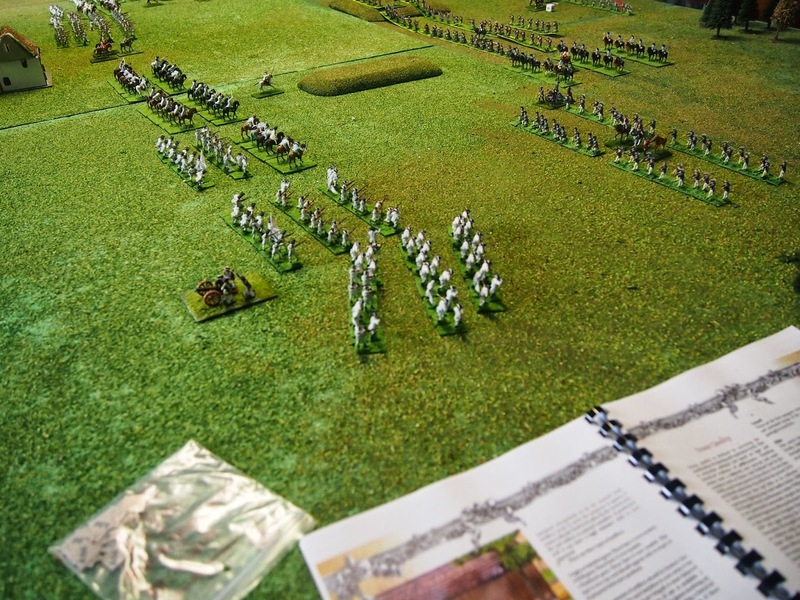 We are wondering whether a lot of the skill in any WSS battle consists in how you deploy initially - there just is not enough flexibility, even without rigid divisional structures of any kind, to shift forces around the table very much. Artillery are a fine example of the issue. 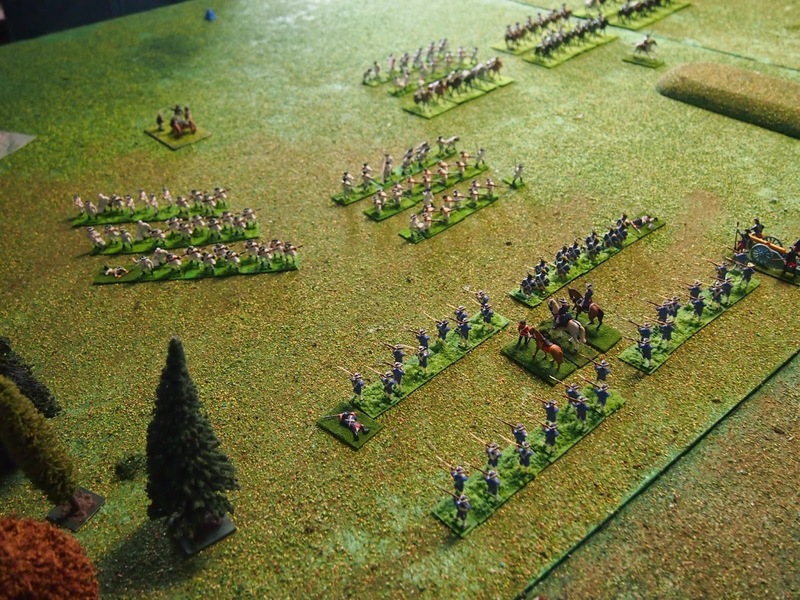 As with AOR, an extremely tempting manoeuvre is to swing one unit to the side, enabling the unit behind it to come into action. 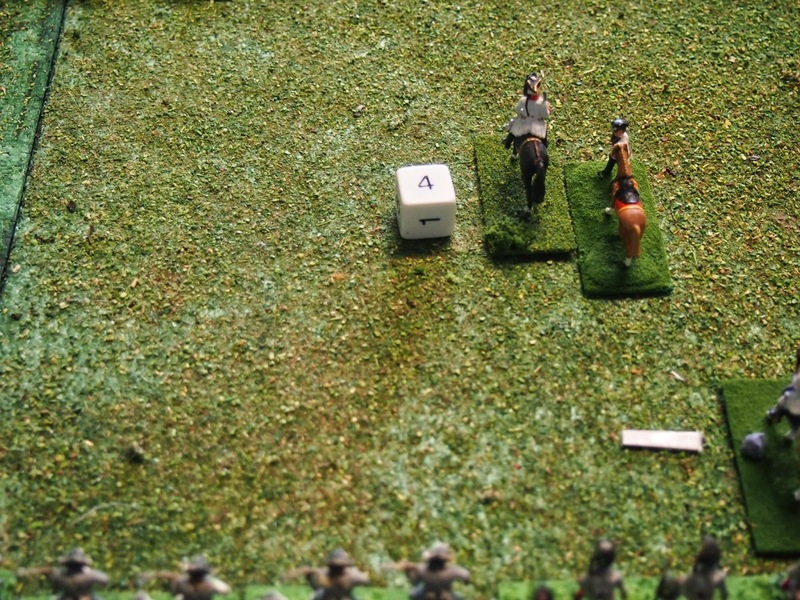 According to the BLB firing rules, both battalions were able to fire. A much clear view of the same engagement. It's a particular situation that we will keep under close review as it can definitely influence the outcome of a firefight. Move 8, my last move available, and something dramatic was about to happen. 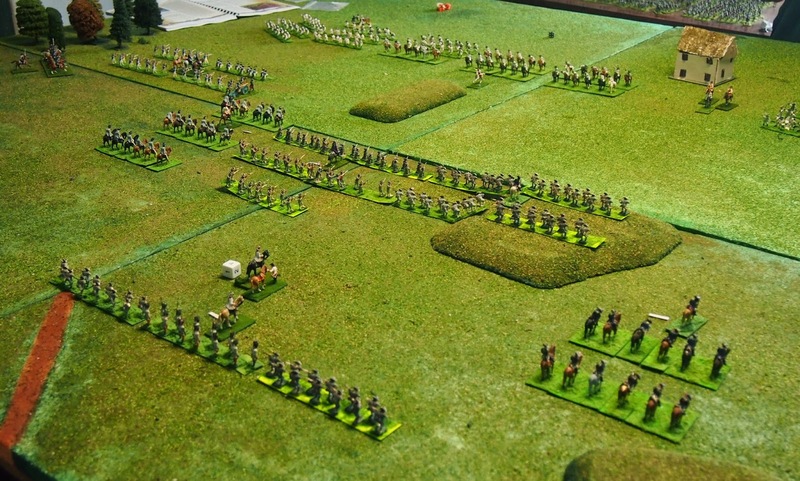 Here we are: the Austrian infantry in the front line, despite having suffered very heavy casualties, passed morale to attack the Bavarian grenadiers. 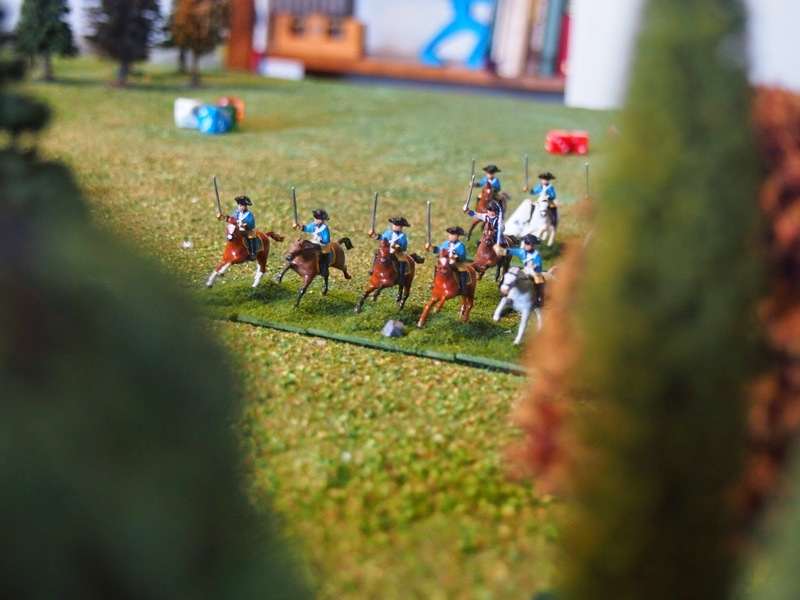 BLB insists on two morale tests, one to see if you do charge and another to see if you charge into contact, but our Austrians passed both despite crippling casualties at point blank range from the grenadiers. You can see the remnants of the engaged battalion on the left. And here they are in perfect view. Concern was mounting over this series of events by this stage, so James was kept busy with the camera. So a more strategic view of the melee is available. 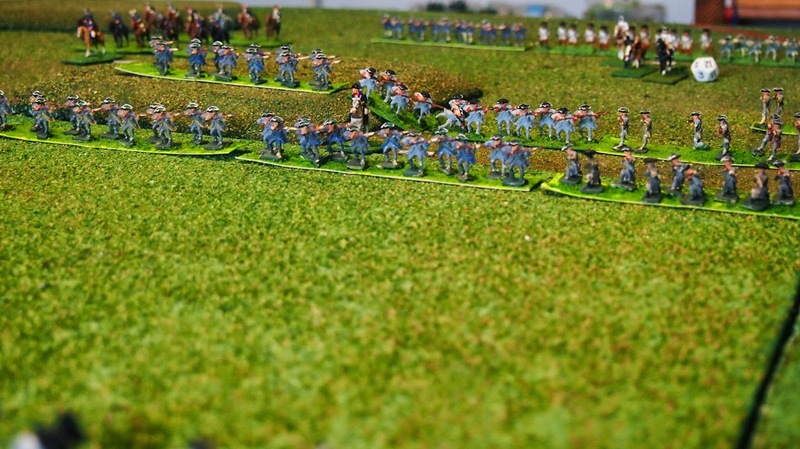 Note the heavily reduced Bavarian line battalion also still sticking around for the fight. 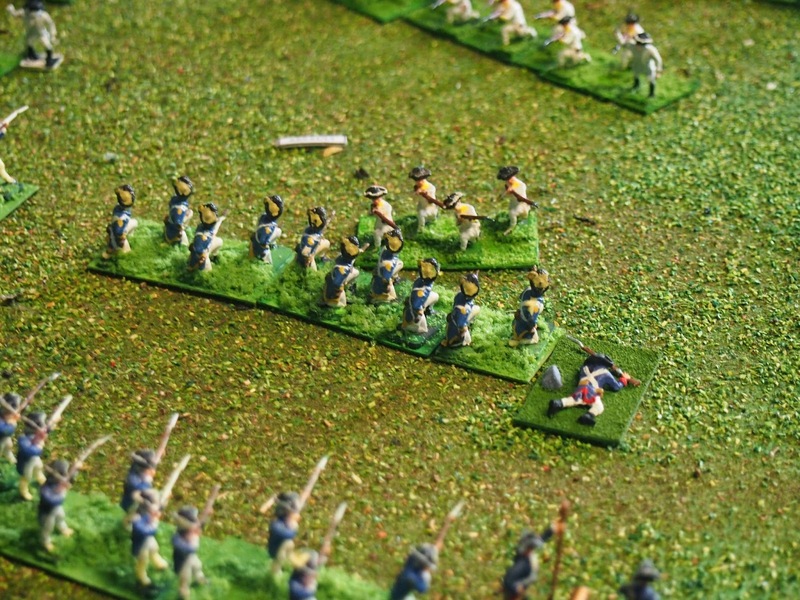 Despite the ferocious firefight and melee on the Bavarian flank, nothing much had happened elsewhere. 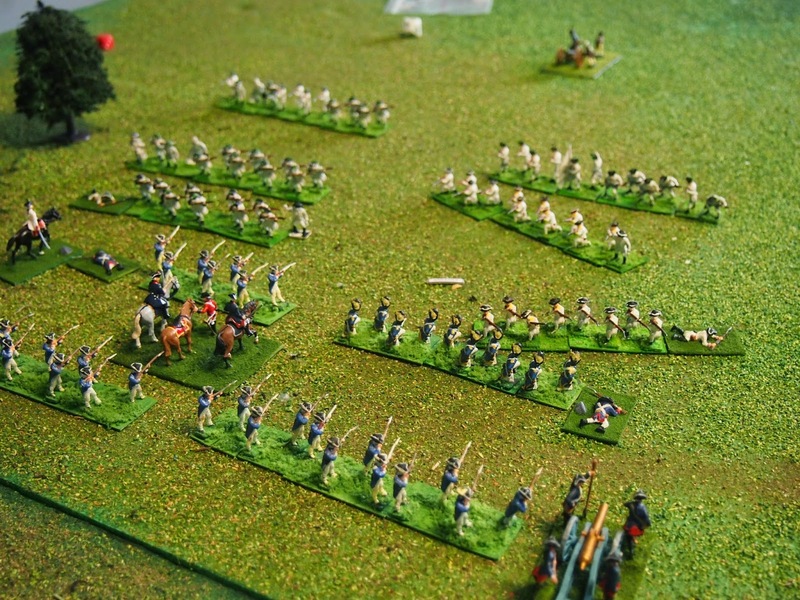 One of the effects of the 'pip' system not allocated by division but by unit, is that as things 'hot up' on a flank or particular part of the battle, pips are increasingly allocated to it. In other words, the disparity between events on particular flanks has a tendency to snowball. 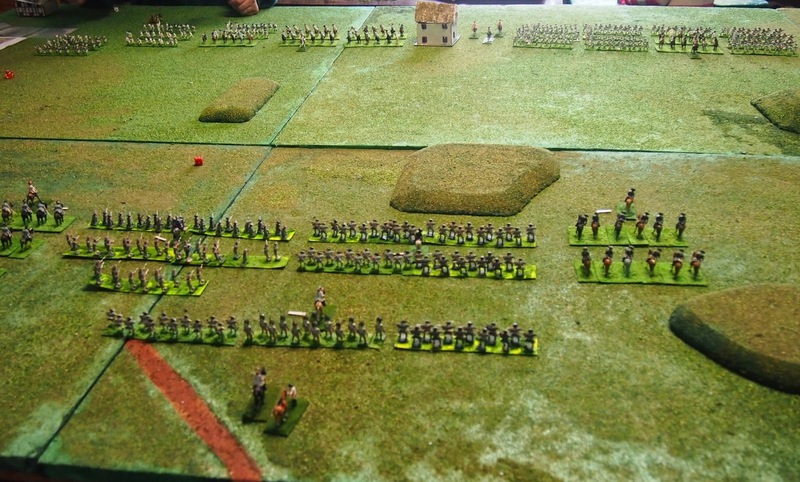 This is nicely brought out in the photo below, the Franco-Bavarian left is heavily engaged - and bear in mind that we were only one hour twenty minutes into the action - say two hours at a stretch - whilst the rest of the army on both sides has hardly moved at all. James and Mark were however by this time deeply involved in the mêlée and James' comments follow below. But as the time-honoured phrase has it, at this point I made my excuses and left. 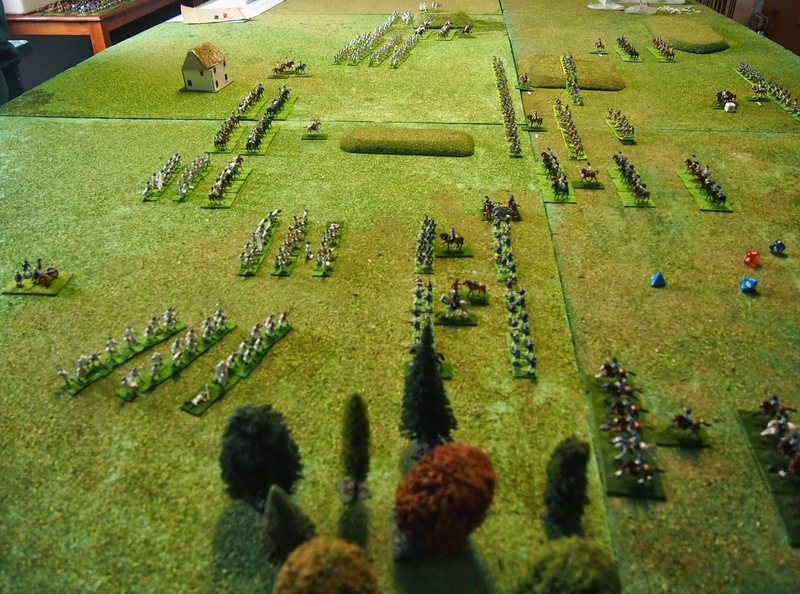 "So, a situation in which we would not expect an infantry battalion to enter mêlée—charging a formed line of good quality troops, being reduced to 1/3 strength on the way in—had resulted, not in the breaking of the weaker unit, but a draw. 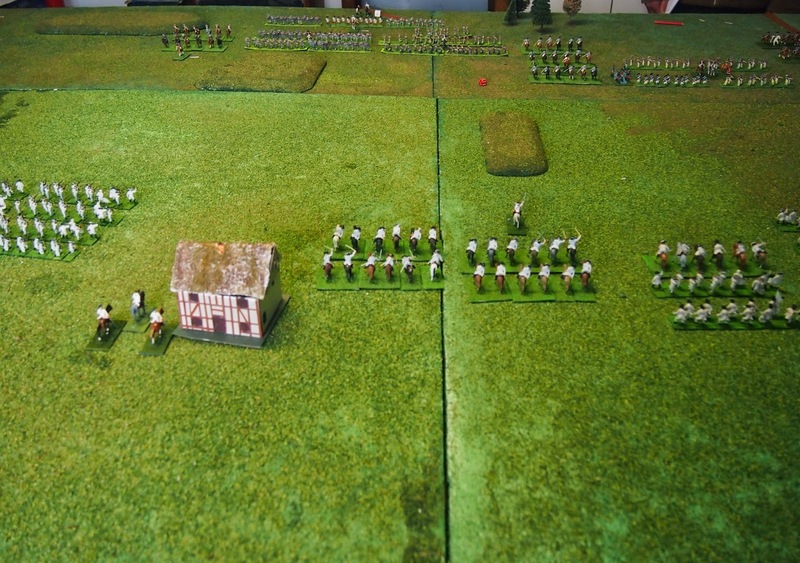 This was not due to fabulous luck on the part of the Austrians, but average die rolls on the part of both sides. We did not think the melee should have begun, let alone ended this way". We now know that Beneath the Lily Banners are not for us. 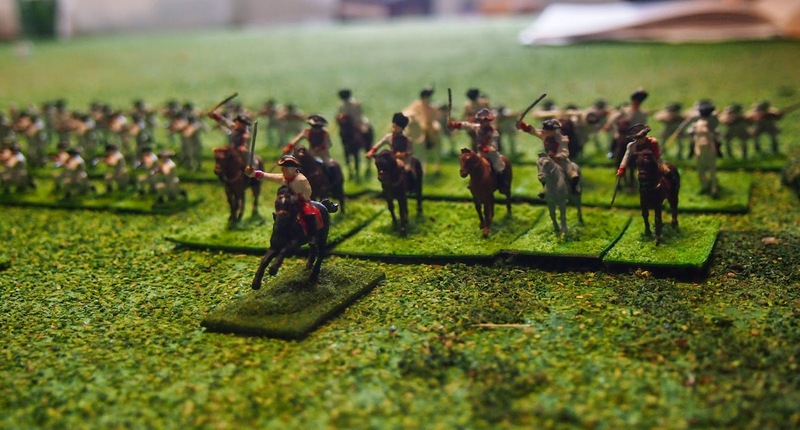 There is nothing particularly abhorrent about the rules, although, as I have pointed out above, the ‘pip-style’ restriction on units which may move in a turn via the number of orders it is not a mechanism that we enjoy, nor favour for such effects. They did not however, offer anything that, to us, is better than Age of Reason; and they did not seem much quicker to fight through either. As a kind of ‘thought experiment’, Mark and James then looked at what might happen in the second round of the mêlée (move 9). 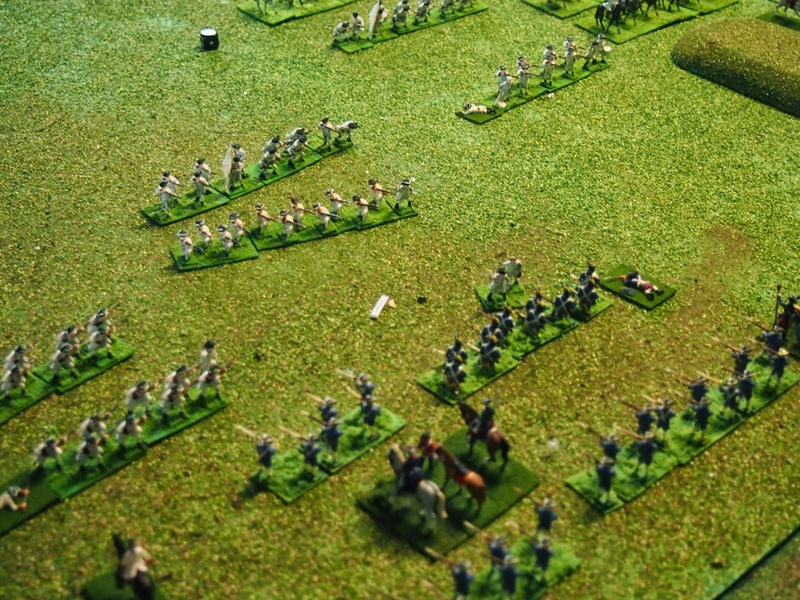 Each turn, both sides may reinforce with one unit if it is within charge reach of the original mêlée. This is a free move that may be completed if a morale test is passed. They assumed this occurred and calculated what would happen next. 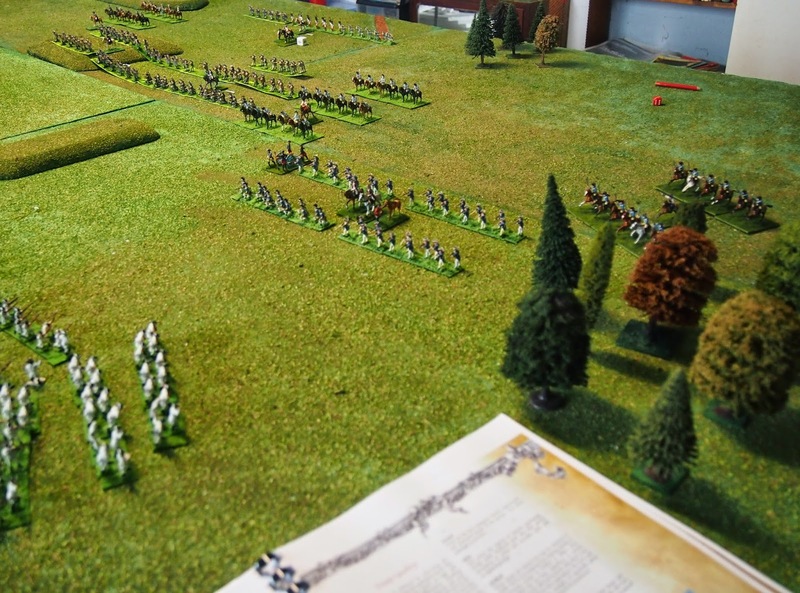 So, said Austrian battalion was reinforced by a battalion of regular line infantry and was now opposed to the near full-strength Bavarian ‘guard’ battalion, which was reinforced by a line battalion of their countrymen. 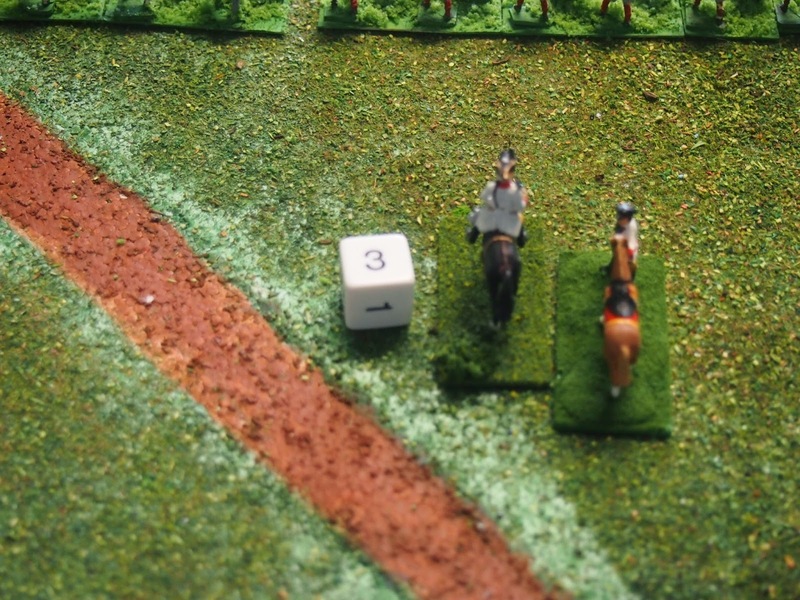 The Bavarians received nine D6 and the Austrians seven. 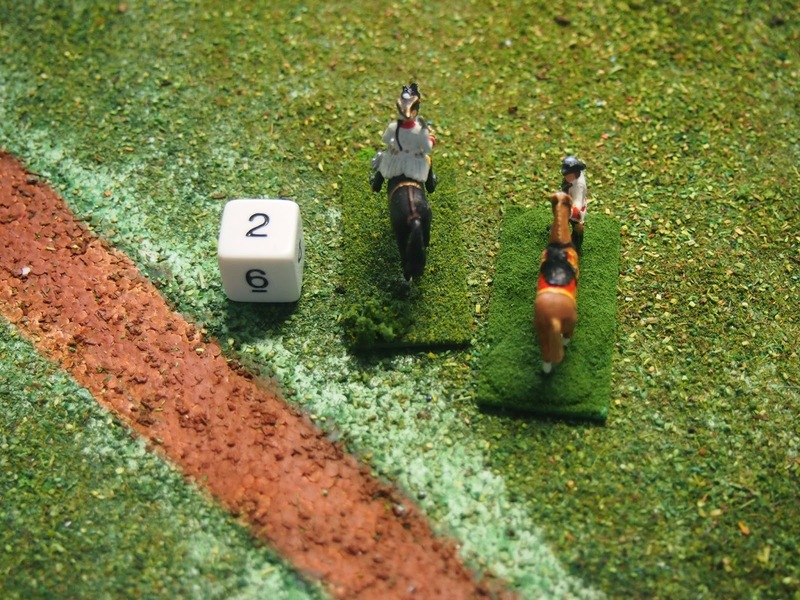 This produced five ‘hits’ for the Bavarians (4 or above) and three for the Austrians. The difference of two meant that the Austrians lost four figures and the Bavarians two. 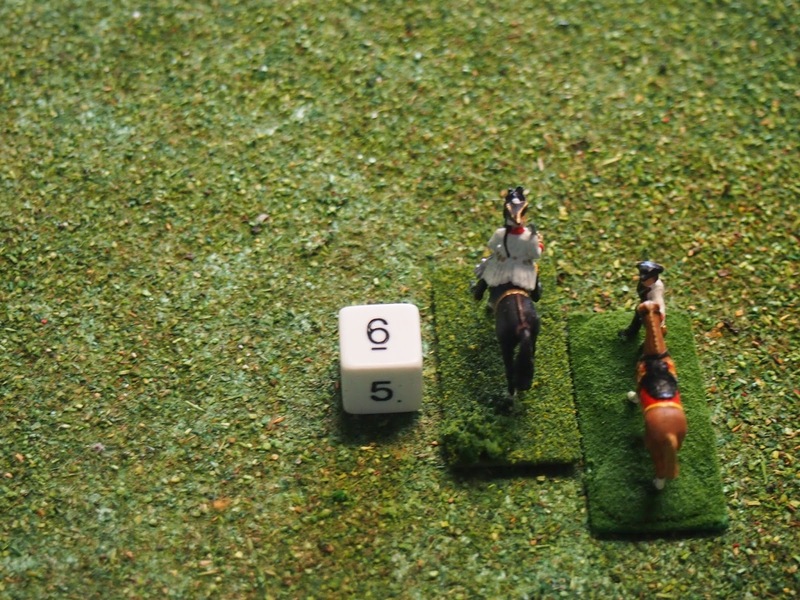 The Austrian ‘élite’ battalion now eliminated, the line battalion took a morale test, rolled a ’6’ and so passed. The mêlée would now go to another round (move 10) in which there was the opportunity to reinforce with the next units in line. Thus we had a growing maul which would last for at least 30 minutes. Not quite our impression of the period. It was great to have tried Beneath the Lily Banners, but they will not be troubling the scorer again at the ANF. 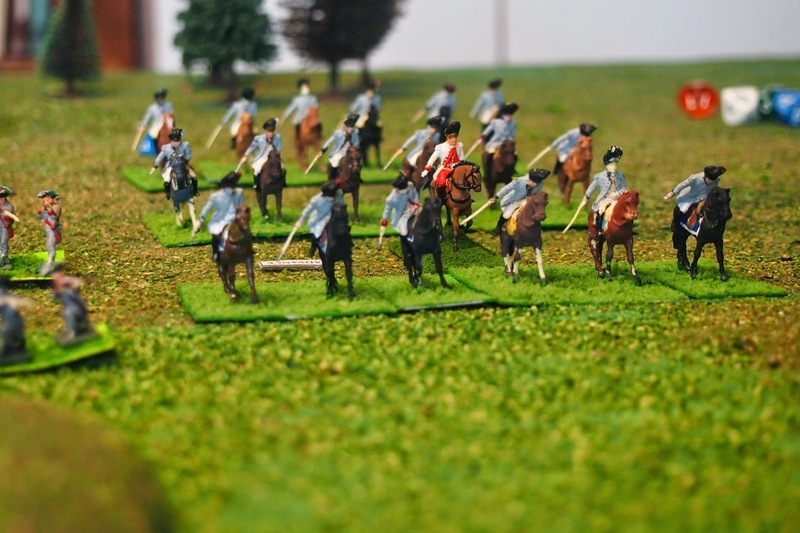 The next sets of rules for the Lace Wars period that we intended to playtest are Gå På 1700–1739 : Wargames Rules for the Age for Marlborough, Eugene & Charles XII. 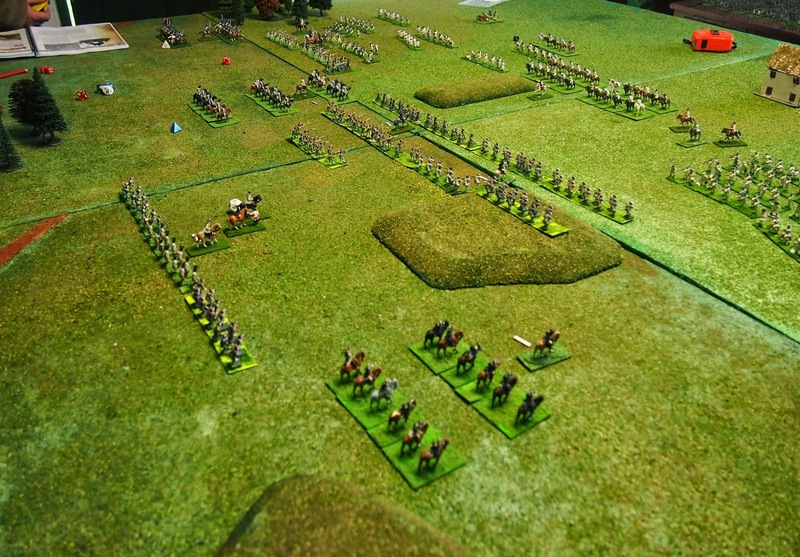 Later we’ll try Polemos Great Northern War, but not until we have some troops for the GNW prepared. It might be fun to use a different set for GNW than WSS and 7YW. We are also considering trying Maurice and Lace Wars but we will read through initially and then decide. 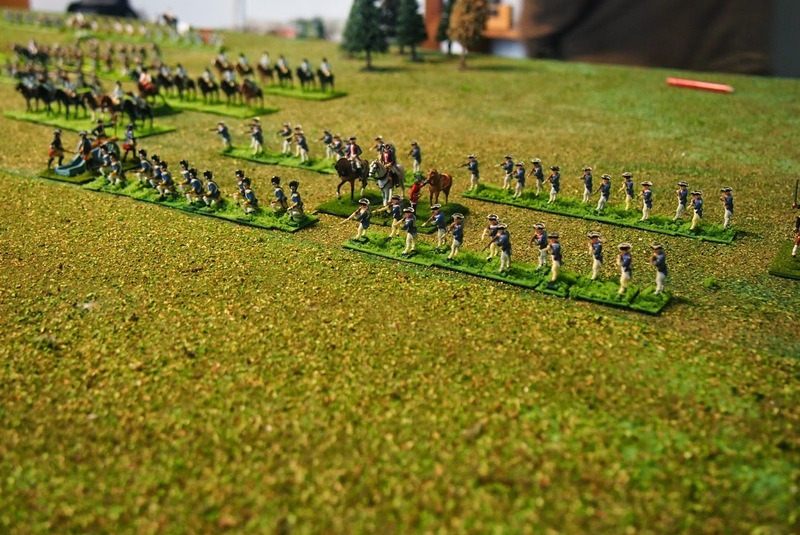 As with our Napoleonic wargaming, having found a set that we are comfortable with, that suits the period and the manner in which we’d like to wargame it, we are not likely to hunt too widely for an alternative—except in order to appropriately match the specific nuances of the War of Spanish Succession. To conclude, below are a few photos of the units involved. It brings me great joy to see these figures finally on the tabletop. While not the 'showroom' quality of many painters and bloggers out there, they are clearly what they are meant to represent and, over time, I'll work on adding more detail (and yes James, sticking the riders on the horses!!). 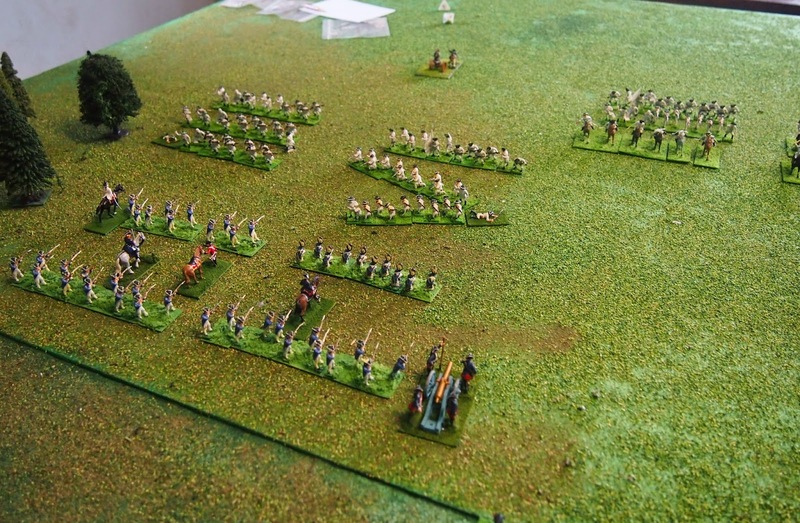 I'm also pleased that we have been able to field two reasonably-sized armies of the War of Spanish Succession almost completely from my 'collection' (the exceptions from Mark's collection are immediately apparent). Some of these troops date back to the 1970s - I have a long way to go to bring them up to a better standard, but I am highly motivated to do just that. Exçellent report chaps. We do very much enjoy BLB at the NWS but it has taken us quite a few games to get familiar with the more subtle aspects of the rules and what works etc. Thanks for the comment, Carlo - much appreciated! As you can see, for us, AOR and BLB were chalk and cheese. I'd be fascinated to know why you don't prefer to use AOR for WSS, even though they are primarily for 7YW. Also your views on the 'pip' wing problem which seemed acute and getting worse as we proceeded. I really must get down to the NWS when you are playing a BLB to see how you do it. It is always interestingh to playtest various rules. Somwe you'll really like, some are OK, but not quite qhat you're looking for, and a few you will take a healthy dislike to! Usualy there are at least some ideas worth "stealing" for use siomwhere! PS - I have quite a few troops from the 1970's still doing very active service myself... such as the Assyrians senn in my last blog post! Love it Peter. Blooming mobile devices, I presume?! And I am itching to get down to the NWS for WoG, SoG, and maybe BLB - anything, really! We'll likely give these a go I reckon Mark. 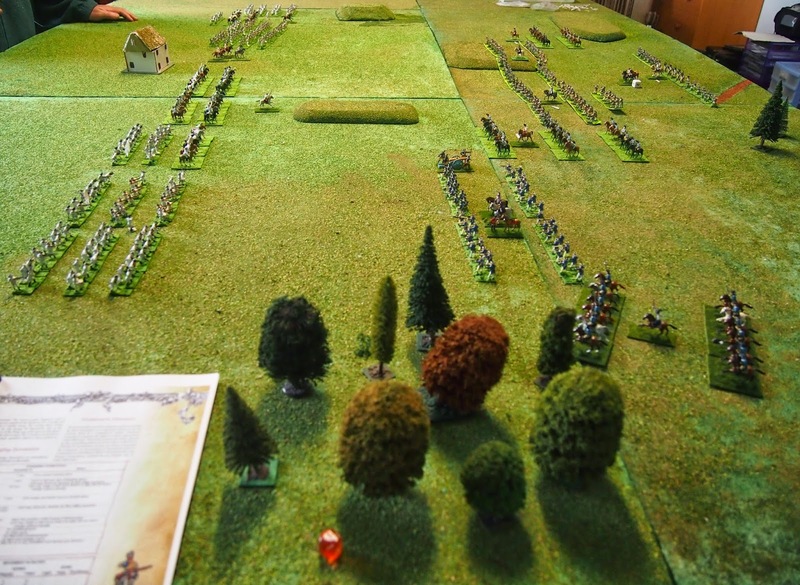 We tried their Napoleonic rules a while back and thought that they played like a set of rules for the early 18th, rather than 19th C! Their GNW rules read well, so will probably get a guernsey at some stage, although they have been surpassed by Gå På, I think (see coming post). Julian! What a useful and enlightening exercise! We would be well served to put various rules under an experimental design as you have done. If time and energy permits, more than one playing of each rules given the same scenario might provide even more insight. I wonder if initial assessments might change with repeated playings? That would be interesting, no?